In our recent Competitive Analysis series, we have discussed a process for determining a firm’s competitive viability based on several factors including available capacity, age demographics, and available qualitative rankings. In our previous post, we discussed gross capacity, which relies on an assumed maximum billable capacity applied equally to all timekeepers depending upon the type (partner, associate, paralegal, etc.). While the maximum potential hours for sale is useful for handling short-term demand fluctuations, a more considered approach is necessary for ensuring consistent performance. We recommend a strategic approach to determine how much time to make available for sale. Specifically, strategic (available) capacity is a measure of hours to sell in the market. This measure is calculated after considering all of the vital elements related to meeting existing client demand, planning for growth, and fulfilling other qualitative demands placed on attorney time. The foundation of this process is the attorney practice plan. The practice planning process carefully considers the balance between billable and non-billable hours. We have previously written about the practice planning process, and we encourage reviewing those articles for additional detail. For our purposes now, assume the following summary is a result of the practice planning process for a five lawyer section (or firm). To view to more clear version of this image, view a full size PDF at this link . In this example, assuming a 50 hour work week and a 48 week year, scheduled hours top out at 2,400. Scheduled hours are less for the first year associate, which is counter-intuitive, but we believe the reality in many law firms. Many young associates need time to develop a partner-level work ethic. It is also our experience that many partners work more than 2,400 hours annually. While this may be necessary to meet client demand, it may actually serve to impede the development of junior lawyers. We understand that each firm is different and has a distinct culture. If your firm requires a high level of hours and still struggles to maintain consistent profitability, it may be time to consider the effectiveness of how your lawyers are spending their time. In our previous posts on the practice planning process, we discuss the merits of spending time in these areas. Notice in this example that the non-billable detail equates to the non-billable budget. Using this workload plan, we can prepare a strategic capacity analysis. As mentioned in the introduction, we like this approach to engaging the market, because it considers the factors necessary for ensuring long-term productive capacity. Firms must be careful not to fall into the trap of flooding the market with average or below average capacity (untrained/inexperienced lawyers) to maintain or grow market share. The effect of these strategies, which are often not conscious, is to diminish the value of the firm, depress billing rates and cause long term damage to client relationships. Here is a link to a full size PDF that also includes columns 7-10. Notice that the billable hours for each timekeeper from the Practice Plan Hours Distribution flow through to the Planned Billable/Client Legal Hours column (column 5) in this model. Note that client service hours are synonymous with billable hours in an hourly billing firm and hours providing legal services in a contingent or alternative billing method firm. A plan that does not consider any of the strategic uses of time would likely make 11,600 ((5*2,000)+1600)) hours available for sale, regardless of the quality of these hours or long term impact on market standing. 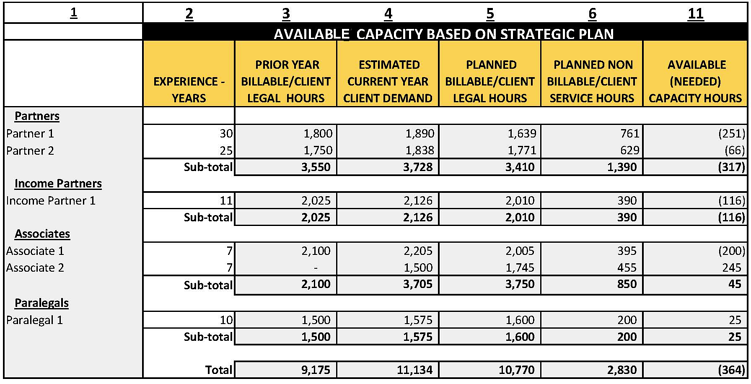 A firm cannot operate in a vacuum, and reconciling Estimated Current Year Client Demand (column 4) with Planned Billable – Client Legal Hours (Column 5) is required to ensure that adequate capacity is available to meet client service needs. In this example, open hours are (364) (column 11), which means that this section has to find 364 hours of capacity to maintain the current plan. We prefer to view growth in terms hours rather than dollars to avoid revenue growth from rate inflation. In this example, a shortfall of 364 hours alone will likely not cause the hiring of a new person. This section may, however, want to hire a new lawyer if a high level of confidence in the marketing plan exists and the anticipated client demand favors the long term. Alternatively, a plan revision is necessary. No conversation about non-billable commitments and investments would be complete without considering their cost. The chart below indicates the full payroll cost of the non-partner non-billable time. There are many arguments that one could have about how to cost non-billable time and whether including overhead is appropriate, but we will keep it simple in this example. The chart below uses the salary and benefit costs per hour to each non-billable hour worked for employees. In this example, the payroll cost of the non-billable time commitment is $79,765, which is substantial. Only payroll staff and contractors are in included at this level. I realize that this is difficult to read. Here is a link to a full size PDF. Segregating marketing time helps call attention to this critical function. Marketing can be both a cost and investment. We classify skill development and training as investments because they increase productive capacity and market value. Where one exists, it may be more worthwhile considering opportunity costs (lost billable revenue) for both partners and associates, but the temptation associated with this level of thinking includes placing too much emphasis on short-term profit. Think of the "lone wolf" who can't seem to create any leverage, or consider firms with high turnover. Assume that this sample section operates in a market with a gross market capacity of 100,000 hours. Based on expected client demand, our sample firm has just over 11% (11,134/100,000) market share. We have previously discussed that based on our sample section plan, there is a capacity shortfall of 364 hours. Further, this section is investing 675 hours into marketing. Suppose this section's goal is to grow their market share organically by 3% to 14%. Accomplishing this goal would require an additional 2,866 available hours. 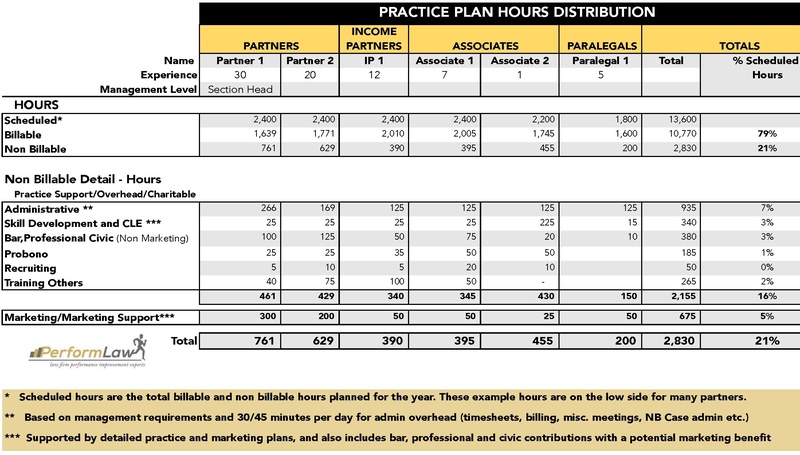 Applying our plan assumptions of 79% billable and 21% non-billable, 3,627 (2,866/79.21%) total hours are indicated - virtually two full-time lawyers depending on staffing level. This situation will test anyone's faith. The leadership of this section must consider the risks associated with prospectively staffing for anticipated demand versus potentially squandering an opportunity due to inadequate capacity as marketing success occurs. As with most decisions, the choices are usually not this plain. Well-run firms hedge these risks with a robust planning process that provides for a measured investment, accountability, and a reasonable approach of short-term profit protections. Deciding to add capacity ahead of demand is less risky when a section or a firm is executing on a quality marketing plan, has a very high existing client satisfaction, incents training and development, and operating at a competitive level. Strategically considering available capacity and engaging the market with (at least) a competitive offering provides the opportunity to become a market leader. Those who already enjoy market leader status will appreciate the value of this approach as they seek to maintain their dominance. Our next post in this series will focus on analyzing and improving economic performance per hour. Please feel free to engage us on Twitter at @performlaw, LinkedIn or contact us directly performlaw.com.